This Jeanneau Sun Odyssey 49DS is the sought after owners forward cabin version offering three spacious double cabins outside of the saloon, and one of the last models with a full teak interior. Dreamcatcher has been comprehensively prepared for long distance ocean capable cruising by her second owner and has proven perfect for the task! Her huge inventory includes a fully furling rig, bowthruster, Gori folding propeller, watermaker, comprehensive power generation inc solar and DuoGen, Hydrovane self steering, coppercoat, lightweight RIB & outboard, liferaft, EPIRB, upgraded nav equipment inc AIS and much much more! 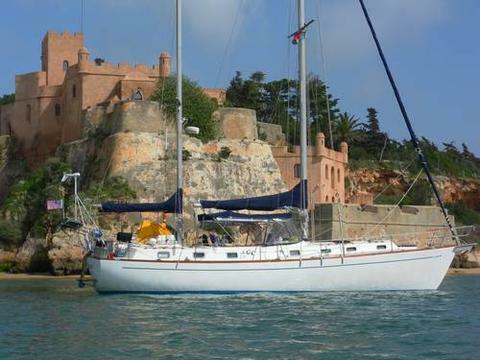 After four years of exploring she is now offered for sale 'ready to enjoy' bluewater cruising in comfort! An almost unique opportunity, her upgrades to prepare for this use would be likely to exceed £50,000 alone. Owner's version with two double aft cabins and large owner's forward cabin offering up to seven berths in three cabins and the saloon with excellent headroom. The twin aft cabins can be converted to form one very large aft cabin if required by taking out a removable centre partition. OWNERS CABIN: Spacious forecabin with a large central island double berth with luxury mattress, removable leeboard for passagemaking (new 2014), dressing table, two hanging lockers, ample stowage in various lockers and access to dedicated en suite. Twin overhead opening hatches provide excellent natural light and ventilation combined with two 12v Caframo fans (new 2014) for cooling. EN-SUITE FORWARD HEADS: Jabsco marine toilet (new pump 2014), wash basin, shower in separate shower area and storage. SALOON: Large C-shaped settee seating area to starboard offering a single berth (conversion legs to drop table included but no cushion), table with storage, and additional settee berth to port (with leecloth). Various storage lockers including a drinks cabinet and useful under floor stowage with recessed hinges and finger catches. GALLEY: Aft to starboard and equipped with a two burner gas cooker with grill and oven, extractor fan, large stainless steel double sink, hot and cold pressurised water system and large 12v refrigerator (new compressor 2014) and second smaller fridge. Ample stowage provided in various lockers, drawers and shelves with 12v Caframo Safari fan (new 2016). NAVIGATION STATION: Located aft to port with instrumentation, electrical distribution panels, stowage and 12v Caframo fan (new 2014). MAIN HEADS: Aft to port with Jabsco marine toilet (new 2014), wash basin, shower, storage and holding tank (50 litre). En suite access via the port aft cabin. AFT CABINS: To port and starboard of the companionway, each fitted with a large double berth with luxury mattress, removable leeboards for passagemaking (new 2014), hanging locker, stowage areas, 12v Caframo fan (new 2014), opening hatch and portlight. The central bulkhead can also be removed to create a very large aft double bed if required. GENERAL EQUIPMENT: Pressurised hot and cold water supply throughout via calorifier with immersion coil. Echotec 250PML 12v watermaker providing 50 litres per hour (new 2014, regularlyused and serviced). Jabsco water purifier/filter at galley tap (new 2018). Cream leatherette upholstery with cream coloured curtains and blinds. Cotton berth mattress cushions. Full teak interior with teak and holly strip floorboards. Lighting in high usage areas has been converted to LED for power conservation (new 2014). Upgraded Sony USB/Bluetooth marine stereo system (new December 2017) with saloon and cockpit speakers (new December 2017). 1500w Inverter for mains power whilst away from shorepower. Fractional rigged sloop. Silver anodised Selden mast with double spreaders and in-mast furling system, with folding GRP mast steps to masthead (new 2016). Silver anodised Selden boom. Spinnaker pole (new 2015). Stainless steel standing rigging (new 2017) with removable Dynex Dux inner forestay (new 2017). Terylene running rigging (continuously checked and replaced when required). Facnor 290 headsail furling system (new 2017). 2 x Harken ST60 2-speed self tailing sheet winches. 2 x Harken ST40 2-speed self tailing halyard winches. Located beneath companionway, Yanmar 4JH4-HTE 110hp (larger upgrade engine) turbocharged 4-cylinder diesel engine. Freshwater cooled. Single lever controls (new 2017) with electric start. Rotomold plastic 240 litre fuel tank. Shaft drive to Gori 3-bladed propeller with overdrive facility. Bowthruster with control at helm. The engine has been maintained to an excellent standard, with regular servicing according to schedule. In addition, all hoses have been replaced, an upgraded Racor fuel filter fitted and replacement stainless steel exhaust elbow in 2014 together with new steering and throttle cables in 2017. During current ownership it has proven faultlessly reliable, economical and has never been run to just charge batteries. 8 x 12v Batteries (5 x 105ah domestic new 2018, starter, bowthruster and windlass new 2014) charged via 136ah upgraded engine alternator (new 2014) with smart controller (new 2017). DuoGen combined wind and water generator (new 2014). 3 x 140w Photovoltaic solarpanels mounted on custom stainless steel frame, with Victron MPPT charge controller (all new 2015, still currently providing power exceeding specification). Shore power system with ring mains, immersion coil and upgraded Victron 60ah battery charger (new 2018). 1500w Inverter supplying mains power when away from shorepower. Battery monitoring system (new 2014). Full cabin lighting (upgraded to LED in high usage areas, with red lighting where appropriate for night vision). 12v Sockets. The combination of the optimised engine charging, large high quality solar panel installation and DuoGen wind/water generator allows Dreamcatcher to be electrically self-sufficient in all but the worst weather conditions, whether at sea or at anchor. The engine has never needed to be run to charge the battery bank and the watermaker has been regularly used whilst away from shorepower. In addition to the above, Dreamcatcher comes with a comprehensive set of electronic and paper charts, together with necessary courtesy flags and pilotage books, for a circumnavigation. Jeanneau Sun Odyssey 49DS built by Jeanneau Yachts in 2007. White GRP hull (epoxy and copper coated in 2014), superstructure and decks with moulded non-slip surfaces. Cast iron fin keel. Spade hung rudder with twin Lewmar steering wheels (new steering cables 2017, wheels recovered 2015). Large self draining cockpit with white folding cockpit table, teak laid seats and cockpit sole. Two cockpit and lazarette lockers with a large sail locker forward. Opening door to transom with steps down to water. Her maintenance schedule has been to the highest standard, with all systems regularly serviced including stainless steel cleaned and polished, anodes regularly checked and changed, sails serviced, uprating of deck fastenings and fittings where deemed necessary, hatch rubbers renewed to prevent future water leaks etc etc. In our opinion you are unlikely to find a boat of her kind that has been better kept! Dreamcatcher is a fantastic yacht that has been lovingly cared for and maintained, inside and out. Her easily driven hull gives her a great turn of speed and she sails superbly however many, or few, crew you have. Below decks she is spacious and airy, with lots of natural light and ventilation. The sleeping cabins have worked well for crew for months at a time, with her safe and comfortable layout whilst the galley has proven more than capable of producing a good meal for all on board! On deck, her big open cockpit is great for socialising in harbour - we have entertained up to 11 seated at once! Deck access and movement around her is great, with lots of storage for any additional kit we needed. We are selling her with much pride... and sadness. She has kept our schedule, looked after us in all conditions and enabled our dream to come true! She is lovely to look at, mechanically well maintained and is self-sufficient in both water and 'green' electricity.